MANILA, Philippines – The Alaska Aces proved the fans that their 1st place finish after the elimination round is no fluke by whopping the Purefoods Star Hot Shots and taking PBA Governors' Cup semis game number 1 of their best-of-five series, 97-91, on Wednesday, July 1, 2015 at the Smart Araneta Coliseum in Cubao, Quezon City. Purefoods Star Hotshots’ reinforcement Marqus Blakely beat his rival-import at the opening jump ball and drove hard to the basket for an and one. Unfortunately, he missed the charity. 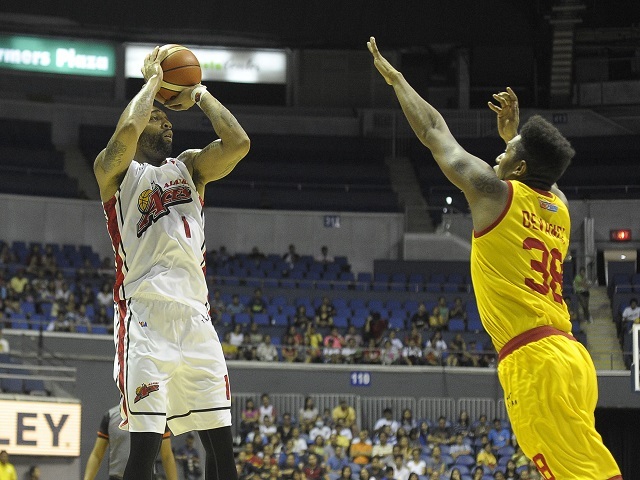 On the other end of the court, Alaska Aces’ Romeo Travis put his team on score board with a bank shot. It was a preview of what this series could be: Two of this conference’s first and original choice imports who will bang bodies and who will dive and die hard for their respective teams. The last time that Purefoods and Alaska met in the semifinals was in 2013 Commissioner’s Cup, where the Aces won the series 3-1. But today is different ball game. Both teams have proved that they both deserved the finals spot: Alaska who topped all teams during the eliminations and; Purefoods who swept and took Globalport’s twice-to-beat advantage. It was all Hotshots in the opening quarter of this best-of-five series with their quick-phased game play for a total of 7 fast break points. All Purefoods-starters had scored at least 3 points after the first 12 minutes. Marqus “Mr. Everything” Blakely had 7 and 5 and cherished a 10-point 26-16 1st period Star lead. “What you can do, I can do better”. Ping Exceminiano easily located the cutting Romeo Travis in the Middle for a two-handed slamma jamma. Right after Travis’ emphatic dunk, Marqus Blakely soared high on the right corner of the basket and put back PJ Simon’s tear drop for his own version of slam dunk. Aces Head Coach Alex Compton tried different combinations of players on the floor but all of his boys kept missing in contrast to Coach Tim Cone and his boys who kept on scoring as high as 18 points in the 2nd period. The Hotshots relished a 15-point, 48-33 at the end of the 1st half. Blakely and Yap were both in double figures, 13 and 10 points respectively. Star Hotshots Center, Ian Sanggalang who has been in the sickbay for over a conference now due to ACL and MCL injuries, has clearly denied the rumors circulating on social media that he intends to play for the most popular ball club in PBA, Brgy, Ginebra San Miguel after his contract with Purefoods expired. The 6’7” Center and 2nd pick overall in 2013 draft declared that he’s staying with Purefoods and in fact, his contract extension is now in process and hoping to sign it next month. The battle of imports continued at the start of the third quarter. Both Blakely and Travis scored early but it was the Alaska sentinel who had a slight edge. Travis swatted Blakely’s baby hook that led into a JV Casio-three-pointer. The Aces blitzed for a 12-0 run to cut the deficit to just 5, 53-48 with over 8 minutes remaining in the 3rd. But “Mr. Everything” momentarily spoiled Aces’ run with his fast break layup plus a foul. Series of unfortunate events piled up for Coach Compton as his energizer, Calvin Abueva committed his 4th personal foul on Mark Barroca. Barroca sank his foul shots and regained their double-digit lead. Romeo Travis beat the buzzer with a long distance shot and Vic Manuel made a basket plus a foul to overcome Purefoods’ 18 point lead. The Aces managed to tie the score 70-all entering to 4th and final quarter. Chris Banchero sliced through the Purefoods defense to grab the lead. The Fil-Italian guard did the same thing and same result with a foul. He missed the free throw however but got his own rebound and located the open Don Don Hontiveros at the left corner for a ring less trey. Alaska with 77-75 lead. Marqus Blakely promptly countered with a layup and a tomahawk dunk to cut the Aces’ lead to just a half-shot. Coach Alex Compton called a time-out to stop Hotshots’ run. Compton’s timeout helped Alaska to regain its composure. Travis held his ground against Marc Pingris Yousef Taha to increase their lead. This time, Travis went ahead of his counterpart in scoring. Alaska import had a game high of 28 points and 10 rebounds. Coach Compton was whistled for a technical foul for continuous and excessive complaining. Compton was really upset from two consecutive non-calls that involved a clear goal tending violation call against Marqus Blakey off Calvin Abueva’s floater. The Aces started to melt the clock after the final 2-minute warning and held on tight to their 3-possesion ball game lead. James Yap fired a long bomb with 36 seconds remaining in the game clock to trim down Aces’ lead to 4 points. JV Casio placed the icing on the cake by sinking his 2 foul shots, 97-91. Casio was also the Best Player of the Game with 18 points. The Alaska Aces walked away with a game ahead of the Hotshots.